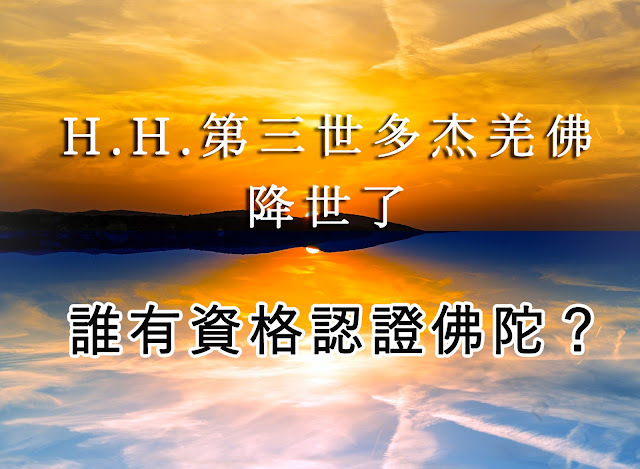 After World Buddhism Publishing and World Dharma Voice Inc. jointly published the book H.H. Dorje Chang Buddha III, and after various media announced the news that leaders, dharma kings, and rinpoches worldwide from each of the major Buddhist sects have recognized the identity of and have congratulated H.H. Dorje Chang Buddha III, people who understand the true situation happily said, “H.H. Dorje Chang Buddha III has formally come to our world. The karmic conditions of living beings relating to good fortune and wisdom have finally matured such that they can now personally receive the teachings of a Buddha.” However, people who do not understand the situation and some demonic people have taken this opportunity to make trouble. They have falsely claimed to be the disciples of certain masters of great holiness and virtue. They have stated on the internet that those masters of great holiness and virtue did not recognize the identity of or congratulate H.H. Dorje Chang Buddha III. Additionally, they have groundlessly criticized our two publishing companies. Many good Buddhist disciples do not know what to do in the face of this confusion caused by this extremely small number of people. Those many good Buddhists have no way of distinguishing between what is true and what is false. They have also used a variety of different methods to inquire of us about this matter. We asked the Office of H.H. Dorje Chang Buddha III to answer these questions, but that office strictly adheres to the admonishments of the Buddhas to be unmoved by any circumstances and to abstain from sullying oneself through quarreling. Our publishing companies understand that the Office of H.H. Dorje Chang Buddha III was right when it said that this is a dispute caused by those who have the mindset of an ordinary person. However, for the sake of the good fortune and wisdom of living beings, we have decided to make an exception and give our open response this one time. This will be the only time we do so. From this time on, we will not answer one after another of this type of question. The reason is that all of this is not part of true cultivation that one engages in on the path to enlightenment. Rather, all of this has resulted from the conduct of those who have extremely strong attachment to self. Such conduct will lead to their descent into one of the three lower realms of existence and is the source of bad karma. FIRST, the recognitions of identity and the congratulations issued by dharma kings and rinpoches to H.H. Dorje Chang Buddha III were solemnly made based upon the realization and karmic affinity of each of those dharma kings and rinpoches and based upon the rules of Tibetan Buddhism for recognizing the incarnation of a rinpoche. All of the dharma kings and rinpoches listed in the treasure book H.H. Dorje Chang Buddha III issued their letters of recognition or supporting congratulatory letters in accordance with the dharma. Moreover, they stamped those documents with a seal required by the dharma or with their own fingerprint. There is something that must first be understood. Could it possibly be that those dharma kings and rinpoches do not clearly believe in the law of cause and effect? Could it possibly be that they would ignore the facts and write recklessly? Those dharma kings and rinpoches, based upon their enlightenment, act with utmost solemnity, act according to the teachings and the dharma, and act responsibly toward living beings. Those recognitions and congratulations are extremely holy and solemn! Therefore, no matter how the outside world acted, we complied with the teachings of H.H. Dorje Chang Buddha III and did not make public those valuable photographs. However, there are now demonic people who are insulting a Buddha and going against their own master. They have already caused great harm to living beings. In order to uphold the dignity of Buddhism and the interests of living beings, we will in this statement refute them with a few points in the hope that these demonic people will stop being bad people, will escape from their state of degeneration, and will have a chance to learn the true Buddha-dharma and attain liberation. Why do we call these slanderers demonic people? They have openly denied, insulted, and opposed the decision of their own master of great holiness and virtue to recognize or congratulate H.H. Dorje Chang Buddha III. That alone is a breach of the fourteen basic precepts of the esoteric school and the planting of seeds leading to rebirth in hell. Such conduct constitutes the conduct of a demonic person. Of course, we believe that among such demonic people are many frauds who falsely claim to be disciples of masters of holy virtue. Such individuals have falsely claimed to be disciples of H.H. 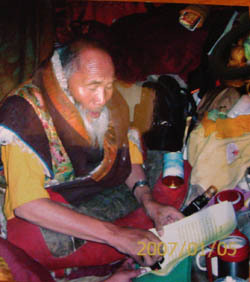 Dharma King Omniscience Jamyang Lungdok Gyaltsen Achuk Lama of the Nyingma school; H.H. Dharma King Jigme Dorje, the supreme leader of the Jonang school; H.E. Mighty Lion Dharma King Renzeng Nima, who is the root master of Nianlong Rinpoche and Dakini Deri Lamao; H.E. Dharma King Ngagwang Pedma Namgyal Palzangpo of the Jonang school; H.E. Xiazhu Qiuyang Rinpoche of the Geluk school; and H.E. Dorje Rinzin Rinpoche, a person of great holiness and virtue who went into retreat for thirty years. They have also started rumors that these masters of holy virtue did not write recognitions or congratulations. In response, we are now releasing photographs of only those masters of holy virtue who those demonic evildoers mentioned; namely, H.H. Dharma King Omniscience Jamyang Lungdok Gyaltsen, H.H. Dharma King Jigme Dorje, H.E. Mighty Lion Dharma King Renzeng Nima, H.E. Dharma King Ngagwang Pedma Namgyal Palzangpo, H.E. Xiazhu Qiuyang Rinpoche, and H.E. Dorje Rinzin Rinpoche. The photographs were taken when those masters of holy virtue were stamping their seal or fingerprint upon the recognition or congratulatory letter that they wrote to H.H. Dorje Chang Buddha III. We would first like to express our sincere apology to those dharma kings and rinpoches. We had no choice but to make public those precious and holy photographs. However, we want to emphasize that our goal in providing people of the world with these photographs is not to prevail over anyone or prove that we are genuine and others are false. Rather, our goal is to tell all Buddhist disciples and all good people that they should not be duped and led astray by those demonic people. We even tell those demonic people whose goals are to harm the true dharma of the Tathagata and destroy the wisdom-root of living beings that they should stop before it is too late and repent. Furthermore, we will only respond to these questions this one time. In the future, no matter who it is and no matter what their goals may be, we will definitely not fall into the net of quarreling and samsara laid by those demonic people. We will not turn over and over in that net, responding to them time and time again. That is because those people who have broken the precepts of the esoteric school are not qualified to talk to us. They are full of negative karma. Whoever comes into contact with them will have bad luck. Within the fourteen basic precepts of the esoteric school there is the clear prohibition against discussions with evil people. Therefore, we will definitely not provide any material on other masters of great holiness and virtue in response to the rumors of demonic people. SECOND, H.H. Dorje Chang Buddha III is the first one in human history to have truly manifested the state of complete proficiency in exoteric and esoteric Buddhism and perfect mastery of the Five Vidyas. The treasure book H.H. Dorje Chang Buddha III contains thirty different categories of accomplishments attained single-handedly by H.H. Dorje Chang Buddha III. Nonetheless, those thirty categories of ccomplishments represent only a tiny bit of the overall accomplishments of H.H. Dorje Chang Buddha III. If anyone has any doubts about this, we welcome him to take the test according to the rules of the Blue Platform Verification that was established in the book H.H. Dorje Chang Buddha III. That test involves achievements in only two of the thirty categories. Anyone who could do that would not only obtain US$20,000,000, he would also prove that everything he said was correct. Anyone who cannot pass that test but who still wantonly slanders H.H. Dorje Chang Buddha III and opposes the recognition or congratulation issued by his own master is undoubtedly a demon who insults a Buddha and opposes his master or is a just a scoundrel in society. THIRD, everyone should ponder the following. H.H. Dorje Chang Buddha III has been able to manifest the dharma through thirty different categories of accomplishments, which shows supreme wisdom unprecedented in history. Assuming that His Holiness had not received recognitions and congratulations from dharma kings and rinpoches of each of the sects of Buddhism, how could such a being of supreme wisdom be so stupid as to falsify documents and thereby subject Himself to great criticism? As publishers, how could we have possibly decided to publish those recognitions and congratulations in the book if we did not have witnesses and evidence proving the genuineness of those documents? If we did not have such witnesses and evidence, what would we use as evidence to prove our case if we wanted to sue those deceivers should they one day become too egregious? The present time is the age of the internet. There is no distinction between far and near anymore with respect to any two places in the world. Anyone with a phone can now determine what is true and what is false. Wouldn’t fabricating those recognitions and congratulations be tantamount to shooting yourself in the foot? 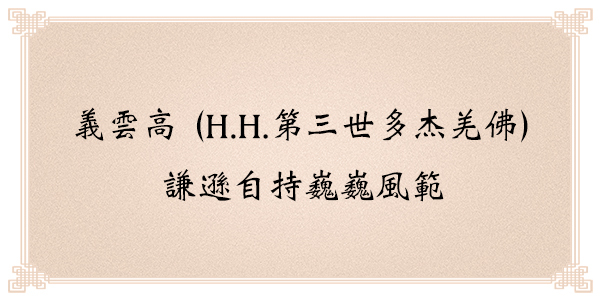 Take, for example, the recognition letter issued by H.H. Dharma King Sakya Trizin. The content of that original letter is published in the book. What is written in that letter is very clear. You will know what it says from one quick reading of it. Moreover, in front of six people, H.H. Dharma King Sakya Trizin personally handed over that already written recognition letter to two people so they could deliver it. One of those two people was Respected Khenpo Chucheng Qupei, who was conferred the title of khenpo by H.H. Sakya Trizin, and the other was Venerable Baima Dorje Rinpoche. Photographs were taken and there were witnesses. Additionally, Respected Khenpo Chucheng Qupei had a photograph taken of him holding the recognition letter written by the dharma king. Respected Khenpo Chucheng Qupei also wrote a verification about it. Thus, some demonic people or deceivers pretending to be disciples of these holy dharma kings and rinpoches are spreading rumors and slandering the true dharma of the Tathagata. If anyone dares to continue this slander, this immoral denial of truth, we will certainly sue them. It is very simple. The truth can easily be discerned. The handwriting, seals, and red inkpads of those dharma kings and rinpoches still exist. Their hands certainly touched the recognition certificates that they wrote. Naturally, their fingerprints are on their recognition or congratulatory documents. Simple forensic evidence can determine the truth very clearly. Moreover, there is evidence of the country and the location in the country where each of those dharma kings and rinpoches was at the time they wrote their recognition or congratulation. There are records indicating when the contact person who received such a document entered and left the country. There are photographs that were taken at the time such documents were handed over. There are many people who can testify as to what happened. There is other evidence as well. All of this is sufficient evidence for us to institute a lawsuit and seek compensation for harm to reputation and economic loss. If the harm that those lowly people cause results in loss of sales of a large quantity of books, we will at any cost take legal measures. In that lawsuit, we will make them show their faces, will discredit them thoroughly, and will bankrupt them. Actually, before the treasure book H.H. Dorje Chang Buddha III was published, Venerable Khu-ston brTson-‘grus g.yung-drung V Henghsing Gyatso Rinpoche, who traveled more than 1,100 kilometers around the island of Taiwan by making a full prostration after each step, predicted that there would be three types of people who would oppose the book. He said, “The first type of people lack knowledge and talent and have low insight. Their opposition will stem from their ignorance and inferior conduct. The second type of people undoubtedly consists of demons who have incarnated as humans. Their savage, cruel, and evil nature will cause them to oppose this book. The third type of people is composed of those who are rinpoches or great dharma teachers in name but who actually lack realization, do not understand both exoteric and esoteric Buddhism, and are not proficient in the Five Vidyas. They will oppose this book in order to hide their shortcomings. However, all three types of people share common characteristics. They express erroneous reasoning, indulge in high-sounding but meaningless talk, utter empty words about the subtleties of Zen, or are so-called highly virtuous people who assume solemn airs. In fact, they have no abilities or realization whatsoever. If you do not believe me, then you should carefully observe them. They could not accomplish the feats shown in even half of the ategories contained in this precious book.” Those people also would not dare say that they will use whatever enlightenment or wisdom they may have to obtain the reward of US$20,000,000 and in so doing show that the recognitions of H.H. Dorje Chang Buddha III do not stand. FOURTH, there are many Buddhist disciples today who say that they learn from their dharma king or rinpoche master. They say that their three karmas correspond with those of their master. However, in a disguised or covert way, they actually oppose their dharma king or rinpoche master. 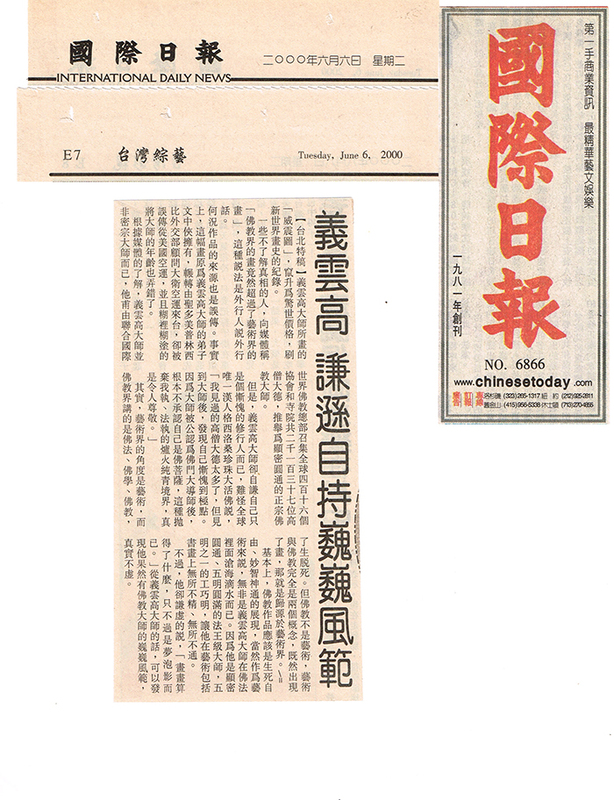 For example, there is the Nyingma Tribune published by the Buddhism Alliance Society on the internet. This is a typical example of those who oppose H.H. Dharma King Achuk while flaunting the banner of H.H. Dharma King Achuk. H.H. Dharma Kig Achuk clearly recognized the identity of H.H. Dorje Chang Buddha III. Those people, however, in a disguised or covert way, go against their master, H.H. Dharma King Achuk, by wantonly slandering H.H. Dorje Chang Buddha III. Based on this alone, they have already completely violated the first of the fourteen precepts of the esoteric school. The fourteen precepts of the esoteric school were not recklessly made up by someone. Rather, from ancient times to modern times, anyone who learns the esoteric dharma must abide by these precepts. For example, when H.H. Dharma King Omniscience Achuk Lama confirmed that Khenpo Aqiong had attained the rainbow body state, he gave clear and definite instructions that strictly prohibited anyone who had violated the fourteen precepts of the esoteric school from touching the deceased body of Khenpo Aqiong. Otherwise, the deceased body of Khenpo Aqiong would not transform into rainbow light. Think about this. Even a greatly accomplished person cannot attain liberation if after he dies his body is touched by one who has violated the fourteen precepts of the esoteric school. Given this, can an ordinary Buddhist disciple who associates with one who has violated the fourteen precepts of the esoteric school still attain liberation? What’s more, those people slandered a Buddha and insulted their master. The only place that could await them is hell! The fourteen precepts of the esoteric school clearly state that one will descend into the vajra hell if one drinks the same cup of water that an evil person drank or if one sits on the same bench that an evil person sat on. Those precepts also clearly state that if one talks with an evil person or conspires with an evil person one will surely have committed an offense on par with having committed one of the Five Heinous Crimes. Thus, we say to all Buddhist disciples and good people that if you have met those demonic people who slander H.H. Dorje Chang Buddha III and who slander the dharma kings and rinpoches who recognized and congratulated H.H. Dorje Chang Buddha III, or if you have seen the Nyingma Tribune website or other like websites, articles, etc., you must cut off all relations with such people and must never again visit such websites. Otherwise, not only will you not become accomplished in the dharma, you will instead be contaminated with endless bad karma. Consequently, you will not be able to attain liberation, and you will lose your good fortune and wisdom. But these things are minor compared to the fact that you will be equally culpable as those slanderers. This human life is difficult to come by in countless eons, as is the learning of the Buddha-dharma. If you do not become liberated in this lifetime, could it possibly be that instead you will forever stay in the hell of uninterrupted suffering? Quickly leave those deceivers, bad people, and demonic people. Change your evil ways and follow what is good. If you have slandered out of ignorance, quickly repent and move back toward the shore of salvation. If you do, the magnificent H.H. Dorje Chang Buddha III will empower you, and the dharma kings and rinpoches of great virtue will pray for your good fortune. They will do this to enable you to leave the sea of suffering soon. If you have the karmic affinity to hear only five days of the recorded dharma discourses of H.H. Dorje Chang Buddha III, that will be enough. You will be moved at having found the true dharma of the Tathagata! We will not discuss here all of the many supreme teachings on the dharma given by H.H. Dorje Chang Buddha III. We will only mention here that H.H. Dorje Chang Buddha III has vowed that He will simply benefit living beings and that He will never accept offerings. Is that the conduct of a deceiver or bad person? What bad person in this world has such a mentality? Are there prior examples of this in history? No. There is not even one prior example! Only H.H. Dorje Chang Buddha III, this most magnificent Buddha, has made such a vow and has carried it out!!! FIFTH, both humans and celestial beings deeply admire the awesome virtue of H.H. Dorje Chang Buddha III. On June 21, 2008 in San Francisco, U.S.A., the International Buddhism Sangha Association held a grand assembly to honor the treasure book H.H. Dorje Chang Buddha III. At that dharma assembly, the Buddhas, Bodhisattvas, and dharma protecting deities made nectar descend from a holy tree in order to offer their congratulations. At that time, the hot sun was high in the sky, and it was 86 degrees Fahrenheit. 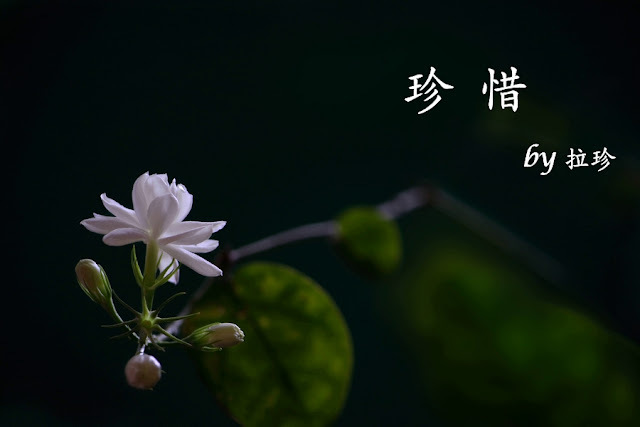 Still, nectar fell for two days and two nights, like fluttering snowflakes in a big snowfall. More than one thousand people who were there witnessed that scene. We welcome everyone to view the video of that scene shot live. That video will be given as a gift to all those with the karmic affinity to receive it. Could it possibly be that an ordinary person is able evoke such wonderful and auspicious phenomena? This thoroughly proves that the treasure book H.H. Dorje Chang Buddha III is a treasury of the highest Buddha-dharma! Let us not engage in idle talk. No matter what status you may have, if you have special abilities, then respond to the Blue Platform Verification offer and obtain the reward of US$20,000,000. If you make false charges, slander, or deny yet do not dare respond to the Blue Platform Verification offer, then everyone will know that you are just a demonic person or deceiver who cannot bear the light of day. That is because you have no morals, wisdom, or skills! 1. H.H. 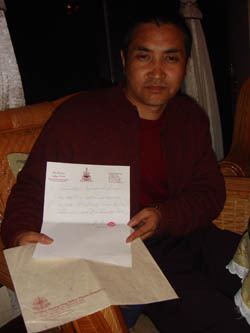 Dharma King Omniscience Achuk Lama stamps his second fingerprint onto the recognition letter he wrote recognizing the identity of H.H. Dorje Chang Buddha III. 2. H.H. 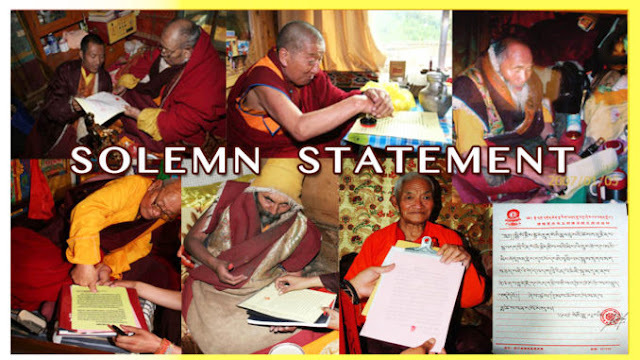 Dharma King Jigme Dorje stamps his seal onto his congratulatory letter to H.H. Dorje Chang Buddha III that he had already signed. 3. 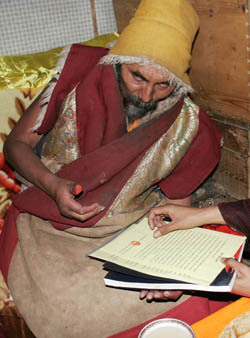 Dharma King Ngagwang Pedma Namgyal Palzangpo stamps his dharma king seal onto the congratulatory letter he wrote to H.H. Dorje Chang Buddha III. 4. H.E. 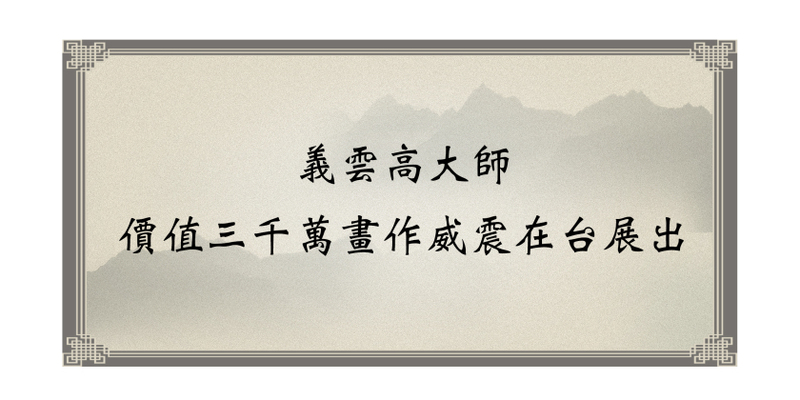 Dharma King Xiazhu Qiuyang has just stamped his fingerprint onto the congratulatory letter he wrote to H.H. Dorje Chang Buddha III. 5. H.E. 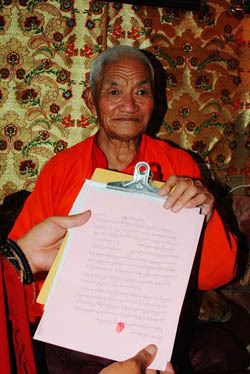 Dharma King Renzeng Nima holds the recognition letter he wrote recognizing the identity of H.H. Dorje Chang Buddha III. 6. Dorje Rinzin Rinpoche, master of the seventh Dzogchen Dharma King in China, stamps his fingerprint onto the congratulatory letter he wrote to H.H. Dorje Chang Buddha III. 7. Respected Khenpo Chucheng Qupei verifies that the recognition letter of H.H. Dharma King Sakya Trizin was personally given to him and Venerable Baima Dorje Rinpoche by H.H. Dharma King Sakya Trizin. In accordance with the recognition of Jamyang Lungdok Gyaltsen Achuk, I hereby recognize that H.H. Yangwo Wan Ko Yeshe Norbu, the son of father Zhonghai Yee and mother Kunfang Xu, is venerable Vimalakirti II, Buddha Vajradhara Dorje Chang Buddha III. On December 10, 2006, after Baima Dorje of the Shechen Monastery and I received from H.H. 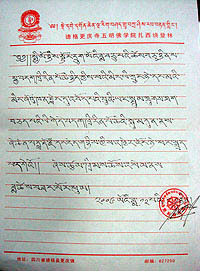 Sakya Dharma King the recognition letter in which H.H. Sakya Dharma King recognized the son of father Zhonghai Yee and mother Kunfang Xu as an incarnated rinpoche, the two of us handed that recognition letter over to the intended party.